The numbers of starlings and sparrows was disappointingly low, as we often see 20+ of each, but they go around in flocks, so you either get a lot or very few. And finally, a flower picture, though it may have a bird-related theme. Those black edges aren’t a camera fault, by the way – I’ve just discovered that Adobe Lightroom has a vignetting tool, so I thought I’d try it out on you. All the flowers on the bush are low down, just as they were last year. Higher up I have to wonder if some birds (bullfinches?) have pecked the flower buds out, as there is a surprising lack of bloom. 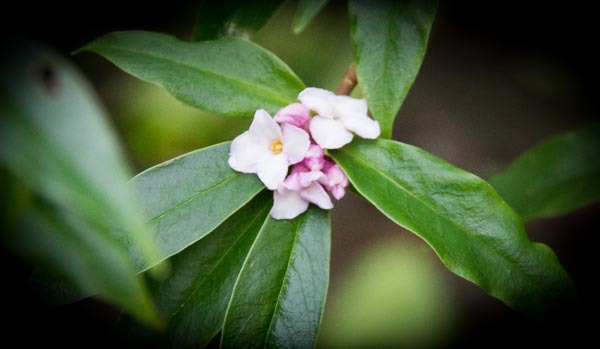 Oh well, I like sharing my garden with wildlife, so I guess I’ll have to share my daphne too. 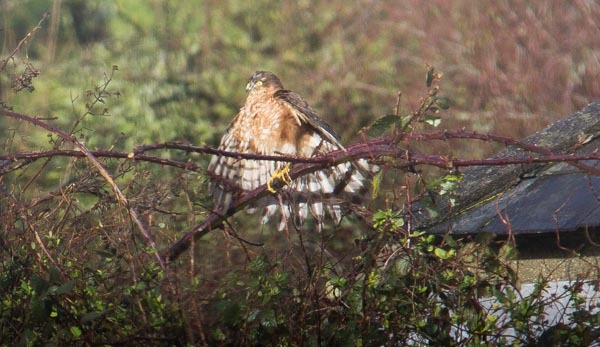 Make 2014 the year you share your garden with wildlife.